About the Book: Sam is excited for his special fishing day with dad-that is until his annoying little sister Lucy comes along. 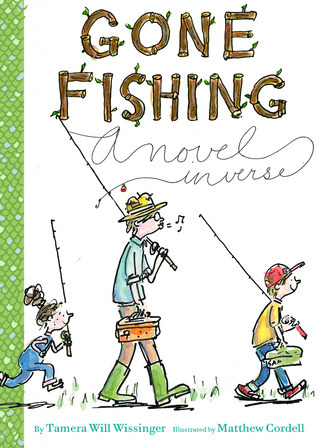 GreenBeanTeenQueen Says: I love novels in verse and Gone Fishing is a perfect introduction to the format for young tweens. I think that while this could easily fit into the tween category, it might be the younger side of the tweens who are perfect for this one. Sam seems about eight or nine in the book. The poems have different narrators from Sam, Lucy and Dad but it's mostly Sam that we hear from throughout. He's having a rough day having his sister tag along and he's not catching any fish. The author does a great job expressing Sam's emotions throughout with his annoyance and frustration about his trip and then also his excitement and change of heart when things start to go well. What I really loved was how the author used various forms of poetry for each poem which are listed at the beginning of each poem. At the end of the book there is an extensive glossary with information on how to write the various forms, poetic techniques like alliteration and imagery, and a nice bibliography for readers wanting more information about poetry. Each page is also illustrated with adorable black and white illustrations. I especially love the illustrations of a proud Sam with fish. Gone Fishing is fun to read and also a great teaching tool about poetry. I love novels in verse-I think because I can read them fast! :) I really liked the different POVs in this one. Great pick for Poetry Month! That's what I thought too Abby! It would be great to use as an intro to poetry. We discussed Love that Dog for the April book club meeting. It sounds like this book would be a great one for next April, especially because of all the different types of poems. I'll definitely add it to my TBR list!